I created this blog in February, 2010, to offer an outlet for my growing analytical fascination with the creative work of the British actor, Richard Armitage (b. 1971), star of “North and South,” “Robin Hood,” “Spooks,” “Strike Back,” and “The Hobbit” trilogy. 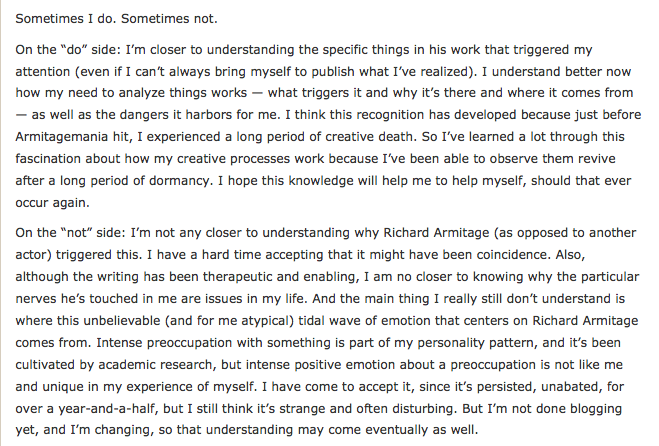 I have no personal or professional connection of any kind with Mr. Armitage. That’s part of the fun. 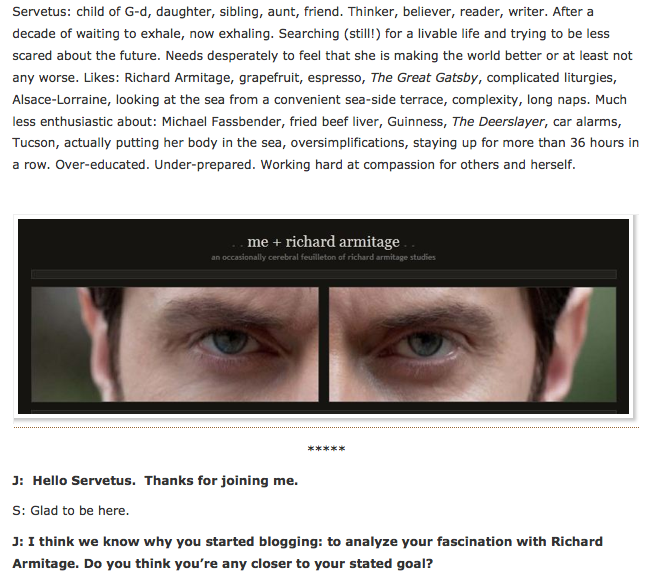 You will notice the title of the blog which puts me before Mr. Armitage. What I write is as much or more about me as about him. This blog is purely for personal growth, enjoyment and entertainment and I derive no profit from it. Neither do I intend any copyright infringement. 5/18/10, ETA: If you would like more information on what I understand to be my interpretive stance, look here. 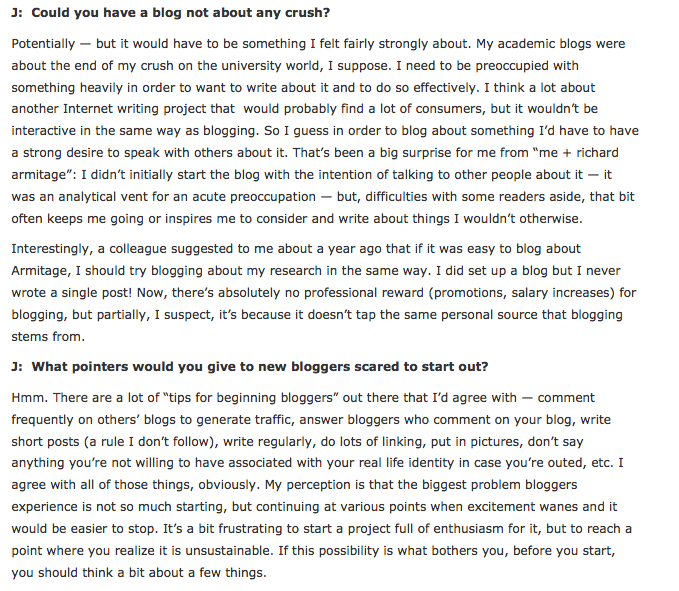 10/29/11, ETA: I was interviewed for a series on blogging by Judiang at “Confessions of a Watcher”. I offer this information in lieu of an FAQ. Part one is here; Part two is here; on 11/8/12, I screencapped the interview referred to above; it follows the contact form, below. You may click on the individual caps to enlarge. 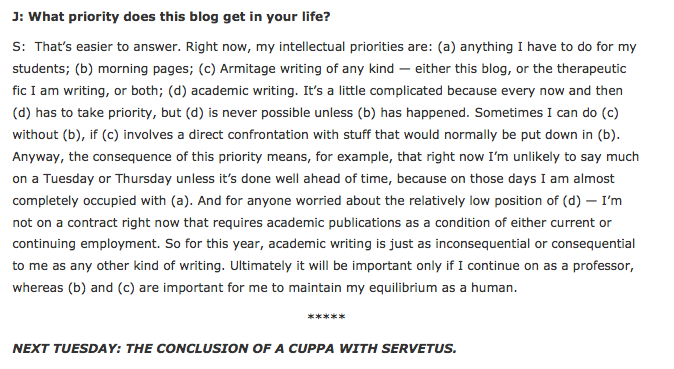 11/9/12, ETA: A collaborator joined the blog: Guylty. 10/20/2013, ETA: I added a formal “comments and privacy” policy. You’re welcome to contact me for any reason. Reasonable messages will be acknowledged and answered. I try to respond quickly, but like everyone in the world these days, I’m busy, so response time may be slow. After the beginning of 2013, it became very slow. I define “reasonable” for the purposes of answering messages of any kind. 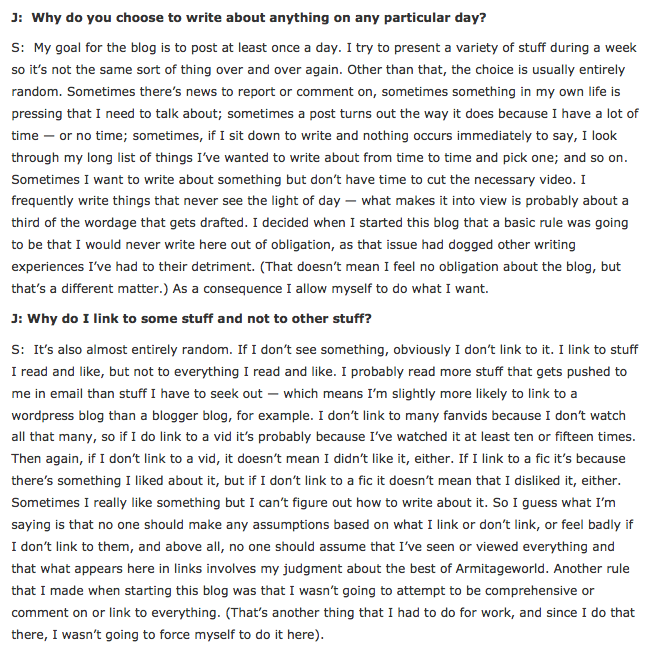 Because the blogosphere is not always friendly, I also reserve the right not to answer for any reason, and not to specify a reason for not answering. But I’m not a black hole. Really, if you’d like, go ahead and send me a message. I’ll do my best. Hi, violissima, welcome and thanks for the comment. Yeah, I’m not a giggler and I’m sure it’s good for me. Darn, being forced by Mr. Armitage to giggle. 🙂 Password for all of those posts is in the subject line of the post, i.e., spooks9 . Hope you enjoy. Great blog! I will add you to my blogroll! I LOVE RA, too! Hello Servetus, very interesting blog because of your psychological knowledge and interest in Richard Armitage as an actor, and these two combined:) We share these interests, I like to see all the photos and comments you have. I think what is so deeply charming about RA is that he is the on the surface the perfect combination of roughness and sweetness. Also he is a leo with those magnetic leo eyes, and he is such a good artist that we feel like we know what kind of a person he is, but we don’t, because there is also this enigma and mystique surrounding him, which makes him that good of a actor. Thanks for your insight on so many things, love it! Gudrun from Iceland. 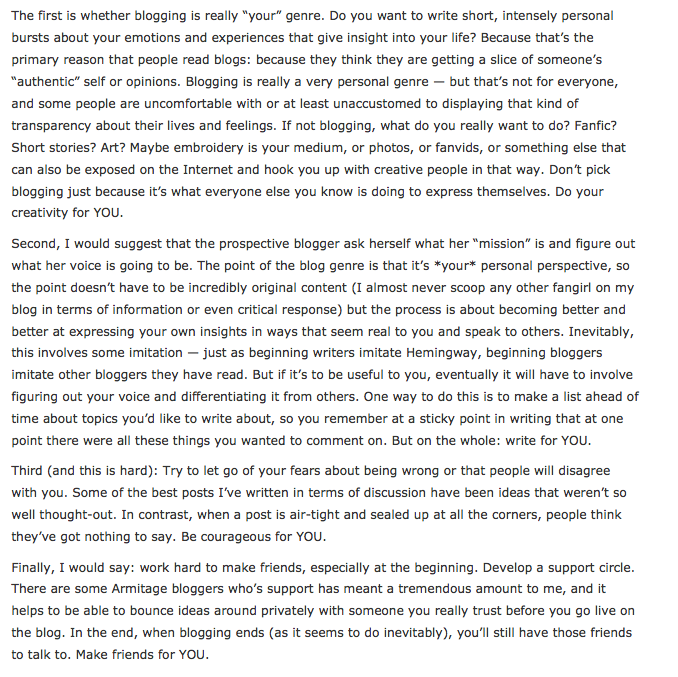 Thanks for the kind words, Guðrún, and for being the first reader from Iceland to “come out” on the blog. He’s a great combination of so many things, I agree!! After reading your blog for about a year and a half I have finally gotten brave to post. I have enjoyed reading your blog, as you have made me laugh and cry on something we call life. I like Richard am a shy person and am happy to just go hide in the back, and since I am short 5’1 I can hide till they push me the short person to the front again. Safe travels! 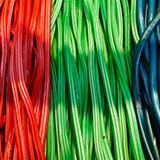 Thanks for the comment, and welcome, katie70. Love your description of your odyssey from front to back and front again!